In memoriam: Lorin Maazel recently died (July 13, 2014) at age 84. He conducted and led many of the world's most famous symphony orchestras, published more than 300 classical recordings, and earned 10 Grand Prix du Disque awards. Perhaps Maazel's most singular and unusual achievement was his appearance in 2008 conducting the New York Philharmonic at a concert in North Korea at the request of the Communist Government of that country. We happen to have an interesting HDVD title about that appearance called The Pyongyang Concert. This title has been, I fear, neglected in recent years. 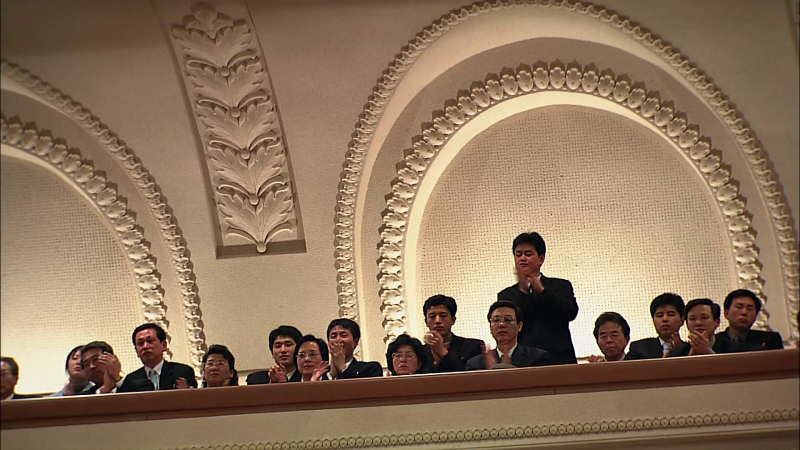 So in honor of Maazel, I thought I should re-review The Pyongyang Concert and provide some screenshots. The concert video was directed for TV by Michael Beyer. The music was recorded with 48kHz/24-bit sampling (probably state-of-the-art considering the traveling required) and provided in PCM 5.1 sound. Still, I doubt the concert would have been released as a recording based on the musical performance alone. The program is rather odd, is afflicted with a brutal case of DVDitis, and is of greater historical than musical interest. The heart of this title is a unique and impressive documentary called Americans in Pyongyang, directed Ayelet Heller. The documentary was filmed in HDTV and has Dolby Digital stereo sound. 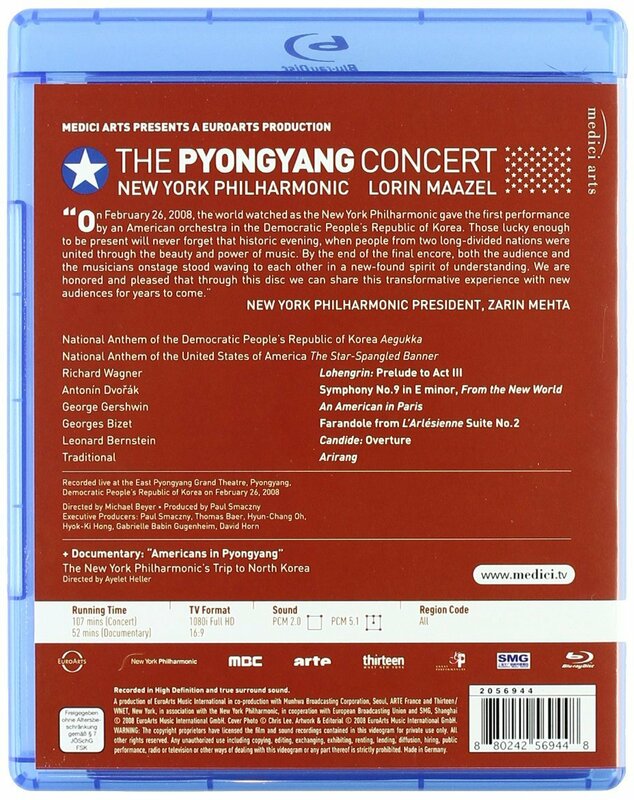 It shows the work done by Maazel, Zarin Mehta (President of the New York Philharmonic), the musicians, and back-stage staff of the orchestra to make this outreach to the people of North Korea. It also covers all the activities of the musicians while in Korea, the concert itself, and further gives us rare glimpes of life in hermit North Korea. To me the documentary is the real story here and the concert is a bonus extra. This title was produced by Paul Smaczny. He combines the vision of an artist, the wisdom of a philosopher, and the killer instincts of a reporter to help give us what still may have the potential to be the most significant entertainment video ever made. We don't know exactly why the North Koreans asked for this concert. But the reason the New Yorkers went is clearly explained: It might do some good! The disc was released in 2008. Grade: A for the documentary. I decided not to review or grade the the concert recording itself. It does no harm. You might want to buy the disc for it's Dvořák Symphony No. 9 (From the New World) or some of the shorter numbers. Now for some screenshots. We start by crossing the Demilitarized Zone at the 38th parallel. Don't go for a walk in the woods! Everywhere you would see portraits of two men. North Korea is history's only Communist nation where leadership of the county is inherited across generations. "Kim" is a common family name in Korea. On the left below is Kim Il-sung (1912-1994), the first Communist dictator of North Korea, whom I call "Kim 1." On the right is Kim Jong-il (1941-2011), the son of Kim 1, or "Kim 2." Kim 2 was the dictator from about 1994 to 2011. The Pyongyang Concert took place in 2008 while Kim 2 was in power. The thought was then afoot that the concert might provide a breakthrough in improving relations between the US and North Korea. This was not to happen, at least not yet. My guess is that Kim 2 started having health problems, which led to an all-consuming power struggle within the inner circle. After the death of Kim 2 in 2011, his son Kim Jong-um ("Kim 3") became the dictator. At this writing in 2014, it appears relations between North Korea and the US have become worse, not better. While the stage hands and TV crews were setting up, there was time for master classes at the conservatory. European-styled classical music is assiduously pursued even if the students have to practice in unheated rooms. None of the students would be so foolish as to show interest in studying abroad. Here the young girl says,"We have enough good teachers. We can learn enough right here." This man on the main floor was asked if the concert might encourage peace. His answer, "We shall see, but in any event, it's a welcome thing." Maazel says we too often listen to our national anthem while eating hot-dogs at the ball park. "The national anthem is really intended for solemn state occasions." I'm not going to torment you with pointless pictures of Maazel conducting or people playing in the orchestra. Rather, I'll suggest how effective Maazel was in his brief comments to the audience. Here he warms up the crowd in well-rehearsed Korean, "I hope you enjoy the show." He even gets a good laugh with his introduction to the An American in Paris number. "Perhaps one day a composer will write a work called . . ."
The concert program seems to me to be rather light-weight and lack-luster, perhaps because there was to be no intermission. But Mehta and Maazel did come up with one programming stroke of genius: an orchestral score for the Arirang, a folksong beloved by all Koreans everywhere. The subtitles read," When we came to our last encore, the Arirang, we felt warmth." Earlier I said subject title might turn out to be the most significant entertainment video ever made. Now that you have seen these screenshots, maybe you can understand this rather outlandish statement. Can you think of any other musical concert that had a chance to change history? So far, we don't know that the Pyongyang concert had any impact on later events. But I suspect there may be many members of the Communist Party in North Korea today who saw the concert or who may have of copy of this disc. Is it possible the concert event and its recording might still yet "do same good"? The answer still has to be "Yes!" And in part we have Lorin Maazel to thank for this.